Leeds Trinity University’s Enterprise Centre – a facility that is designed to foster students’ entrepreneurial skills to help budding new business ventures get off the ground – has been officially launched this week. Roger Marsh, chair of the Leeds City Region Enterprise Partnership, officially launched the Enterprise Centre and communicated the importance of empowering entrepreneurs of the future to realise their true potential. The launch event was attended by key figures from regional universities and the business community, together with a number of students who are all utilising the Enterprise Centre. The students presented an overview of their business plans and shared insights into their start-up journey so far. Roger Marsh said: “It was an honour to be asked to officially launch the Enterprise Centre at Leeds Trinity University. The University’s commitment to support students in launching their own business is admirable and aligns with the LEP’s vision to unlock the potential of the Leeds City Region by supporting growing businesses. The Enterprise Centre is a campus-based building that has been purposely transformed into a space that provides facilities and support for students and alumni to help them develop their ideas for business start-ups. Leeds Trinity University students and alumni now have free access to business mentoring services, as well as meeting rooms, break-out zones, office and hot-desking space, a conference room and all the up-to-date technology and equipment you would expect to find in an office environment. One of the students using the Enterprise Centre who presented his business to the launch event attendees is 20-year-old Joe Edge. Joe is a second-year student in the Department of Media, Film and Culture at Leeds Trinity University and founder of EdgyArts. Describing himself as an urban artist, Joe works on mixed media projects, using acrylic spray paint and stencils to create Banksy-esque popular culture artwork and posters. His art predominately involves famous faces and icons such as John Lennon, Martin Luther King, Dolly Parton and David Bowie. Friends and family have always been supportive, but it was at Joe’s end of year A Level Art Show – where every piece of his two year artwork collection sold out – that he realised there was wider interest in his work. He is currently fostering a relationship with GB eye –one of the world’s leading poster providers. It sells posters in more than 60 countries and could prove to be a real turning-point in getting Joe’s business off the ground. The relationship is in its infancy, but initially Joe is working with the company on bespoke commissions with a long-term view to have his work listed on its site to bolster sales of Joe’s artwork. Joe said: “What started out as a hobby is fast becoming a genuine business and that’s thanks to the support, insight and encouragement from the team at Leeds Trinity University. 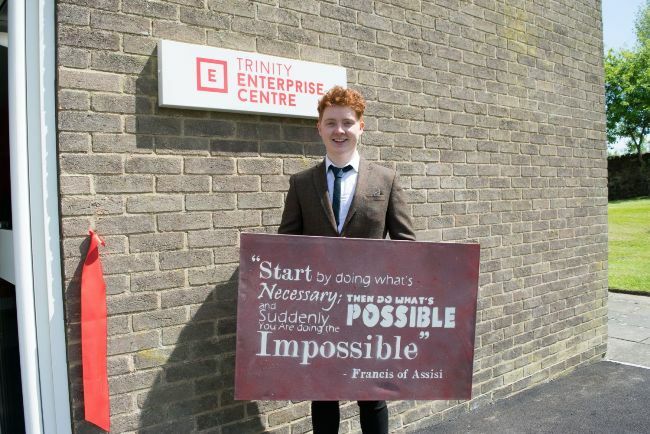 “The Enterprise Centre has helped shape the way I’m looking at my future. I’ve always loved art, but didn’t dare dream that it could play such a huge role in my future. “Being able to sell two years’ worth of my A Level art sparked an initial idea but it wasn’t until I had a conversation with Phil Williams, a careers and employability consultant who is heavily involved in the creation of the Enterprise Centre, that I realised the potential of my hobby and what it could lead onto. “Phil was instrumental in me gaining the commission from the student bar, which led to me selling my posters at the Freshers’ Fair, which in turn helped to establish a profile for my work on campus. “Aside from having access to meeting rooms, brainstorm zones, workspace and all the technology and equipment you’d expect in a traditional office environment, probably the best asset of the Enterprise Centre is the team and people using the space that you get to engage with. Leeds Trinity University is renowned for producing highly employable and enterprising graduates, with the most recent Destination of Leavers Survey from the Higher Education Statistics Agency revealing that 94 per cent of the University’s graduates are in work or further study within six months of graduating. The Leeds Trinity Enterprise Centre and its team aim to build on this by harnessing students’ entrepreneurial ambitions and creating an environment that helps them pursue their career aspirations. Howard Nelson, chief operating officer and University Secretary at Leeds Trinity University, said: “It is vitally important that we support and help feed students’ entrepreneurial spirit, and that is exactly what the Leeds Trinity Enterprise Centre and its team is geared-up to achieve.